Mitoy Yonting, known for his excellent vocal chops and belting, won the Gawad Rajah Sulayman Award (Remarkable achievement as Filipino & as performing Artists) at Gawad Amerika Awards Night at the Celebrity Center, Hollywood, CA, last Nov 17, 2015. Gawad Amerika Foundation is a non-profit organization that is dedicated to helping and cultivation the talents of young Filipino-Americans. Awards are given to Filipinos who are excelling in their chosen careers to honor their achievements and to inspire the younger generation to excel in their respective chosen careers. Meanwhile, Sabrina, Asia’s Acoustic Sweetheart also took home The Philippine Movie Press Club’s (PMPC) annual music award for the 7th PMPC Star Awards for Female Acoustic Artist of the Year last November 10, 2015, at KIA Theater, Cubao. And last but definitely not the least, the biggest winner in this group is also the youngest, singer and performer Darren Espanto was able to bag home several award in two different events! The young singer won not one but two awards in the 7th PMPC Star Awards. He won Best Album Cover Concept and Design, and Best Pop Album of the Year for his debut album “Darren”. 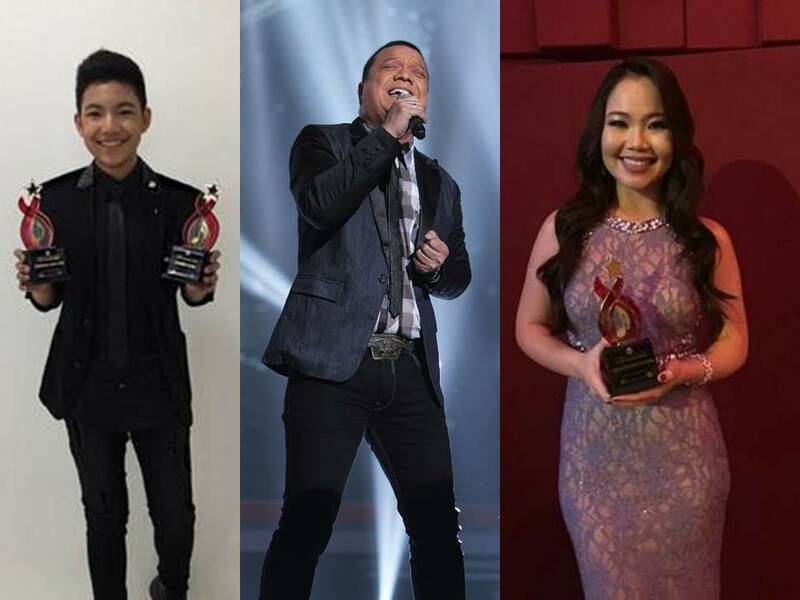 In the first ever PUSH AWARDS held in Resorts World Manila last November 10, 2015; Darren won awards for Pushgram Most Loved Newcomer, Pushlike Most Liked Newcomer, Pustweet Favorite Newcomer, and Awsome Song Cover. The results from Push Awards Night is produced from Push.com.ph, an entertainment website launched last September by ABS-CBN to poll and tally the popularity of celebrities and artists through likes, shares, etc. on their respective social media accounts. Push Awards aims to honor these artists and celebrities and their fans through this awards night. Mitoy has just released his new single “Pangakong Tapat” from his debut album “HanggangWakas”. Its music video is now playing on top music channels and also on VEVO. Sabrina’s latest album “I Love Acoustic 8” came out last August featuring the lead single “Thinking Out Loud”. She recently conquered Korea as the Philippine’s representative at the 2015 Asia Song Festival in Busan. Her duet with Indonesian artist Chilla Kiana for “Thinking Out Loud” is featured in the Indonesian version of the album and is now also playing on MYX. Darren is keeping himself busy with shows around the Philippines with his “D Road Tour” which continues its leg on these following dates: Dec 6 at Tacloban, Dec 12 at Baguio, and Dec 19 at Robinsons Davao. Some dates may still be added in the future. For inquiries and bookings, contact Sammy Samaniego at Sammy Samaniego at (632) 9162504 local 107, (0920) 9682991, (0917) 8565174 or email sammy.samaniego@umusic.com. For more information about MCA Music artists, log on towww.facebook.com/mcamusic, Instagram- mca_music or Twitter- mcamusic.